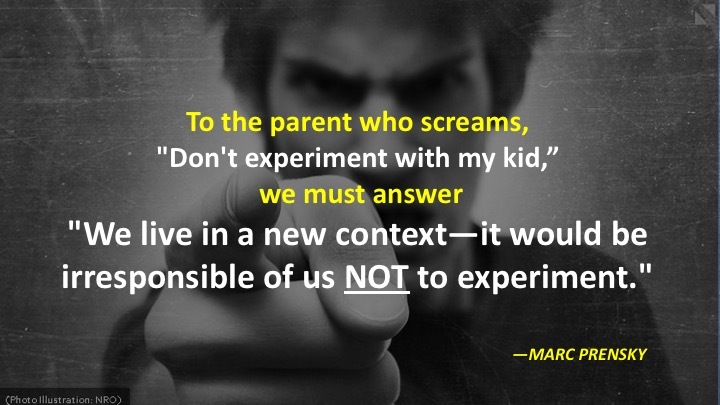 Many parents—understandably afraid—say to (or even shout at) their children’s teachers and administrators: “Don’t experiment with my kid!” Most educators have heard some version of this from parents. “Sorry, but we would be acting IRRESPONSIBLY by NOT experimenting. Your kids are living in a never-before-seen context—very different from the one in which we adults grew up. The world, and your kids’ abilities in that world, are changing radically and rapidly. We do not really know as yet how to best prepare young people for that new world. But we do know that the ways of the past are no longer working and valid. So in order to be responsible educators, we have to experiment, and we can’t be afraid to. As a parent, you need to do the same, following, as best you can, your kids’ lead. “But I just want my kid to get into college,” is the usual follow-up. Here the response needs to be: “Yes, but your kid needs to be prepared not just for college, but what comes after. They need to be prepared for what they, uniquely, can get done and accomplish in the world. How they get to that place depends very much on who they are. Kids who know what they want to do before they start college, and what they expect out of it, almost always get in and do well. 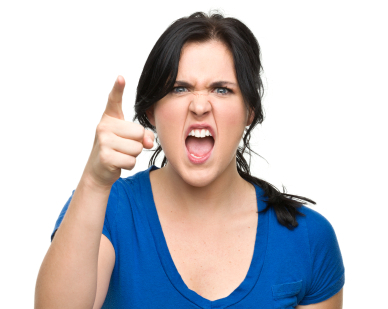 Kids who don’t know what they want from college typically flounder and often don’t finish. (College is an expensive—and not very good—place to “find yourself.”) As a young person, finding out who you are and what you want to do is perhaps the most important task you have (even if it eventually changes). Yet most kids don’t do this, because we, as educators and parents, put so little effort into helping kids figure it out. “So, if you are a parent, I suggest put a lot more effort—and encourage your child’s school to put a lot more effort—into helping your kids learn to identify their own strengths, interests and emerging passions, and to applying those to problems in their world that they care about, in as many “experimental” ways as possible. Not experimenting—and just giving your kids the same kind of education you got (or an “improved” version of that education—including college) without helping them find out who they are is far more likely to produce floundering rather than success in their future world.